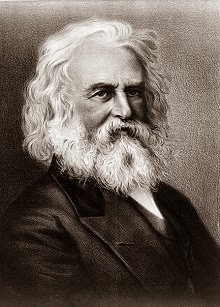 Henry Wadsworth Longfellow (1807-1882) was one of the great American poets of the 19th century. He was born at Portland, a seaport town in Maine, U.S.A. on 27 February, 1807. His father Stephen Longfellow was a lawyer and was originally from Yorkshire, England. H. W. Longfellow was the second one of eight children of his parents. He was friendly, sensitive and meritorious from his childhood. He had his early education at Portland Academy. Then he was admitted in Bowdoin College in Brunswick, Maine in 1822. At Bowdoin, he met Nathaniel Hawthorne who became his lifelong friend. After graduating from there in 1825, he made a long European tour. He returned home in 1830 and became the first Professor of Modern Languages at Bowdoin College. In 1831, he married Mary Storer Potter, an intelligent and beautiful girl of Portland. But his 22 year old wife died during their trip in Rotterdam after suffering a miscarriage in 1835. When he returned to the United States in 1836, he became the Professor of Modern Languages at Harvard University. Then he settled in Cambridge, Massachusetts, where he lived for the rest of his life although he liked to spend summers at his home Nahant. After seven years of courtship he married Miss Frances ‘Fanny’ Appleton, the daughter of a wealthy Boston industrialist, Nathal Appleton in 1843, eight years after the death of his first wife. He resigned his professorship in 1854 to devote all his time to poetry. He was also a devoted husband. But his marriage ended in sadness. After eighteen years of happy married life, Fanny was accidentally burnt to death in 1861. Longfellow was devastated by her death and never fully recovered. He died on 24 March in 1882, after suffering from peritonitis for five years. He was buried at Mount Auburn Cemetery, Cambridge, Massachusetts. He became one of the most popular poets of his day in America and England. He began to write and publish poetry at the age of thirteen. His first notable publication Voices of Night (1839) was a collection of poems including The Psalm of Life, The Beleaguered City and The Midnight Mass of the Dying Year. His other major collection of poems are Evangeline (1847), The Golden Legend (1851), The Song of Hiawatha (1855), The Courtship of Miles Standish (1858), Tales of a Wayside Inn (1863), Birds of Passage, etc. His poetry is based on common and easily understood themes with simple, clean and lucid language.